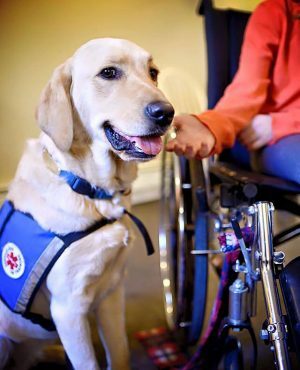 Mobility Assistance Dogs – assist children with mobility-related disabilities and perform tasks such as opening doors, turning on light switches, retrieving dropped items, balance support, and light mobility work. Diabetic Alert Dogs – assist children with type 1 diabetes with tasks such as alerting to low and high blood sugar, retrieving a test kit or a bottle of juice from the fridge, and finding help. Psychiatric Assistance Dogs – assist children with anxiety, depression, or PTSD with such tasks as alerting to a panic attack, performing deep pressure therapy, and leading their handler to an exit. 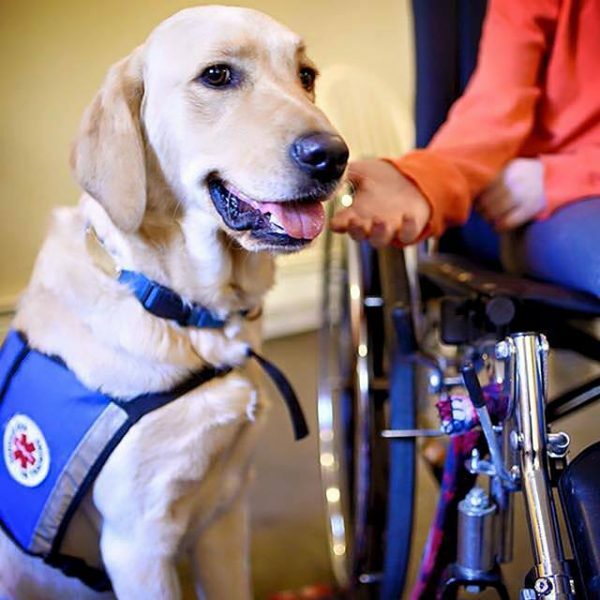 Thanks to the Americans with Disabilities Act (ADA), service dogs have public access so they can accompany their partners everywhere they go and help them whenever needed. A service dog provides calm, dependable companionship and is a helper by the side of his/her child in any situation they encounter. Together, dog and child build a relationship based on a bond that can never be broken. Check our eligibility requirements to see if you or your child might be a candidate. In addition to service dogs, Paws and Affection also trains companion dogs and facility dogs.